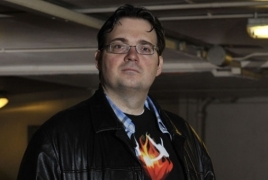 PanARMENIAN.Net - DMG Entertainment has nabbed film and licensing rights to “Cosmere”, Brandon Sanderson’s acclaimed series of interconnected fantasy novels, Variety said. The entertainment and media company has committed to spending $270 million, which will cover half of the money needed to back the first three movies made from Sanderson’s canon. That makes it one of the largest literary deals of the year. DMG beat out several interested parties for rights to the series. As part of the pact, insiders say Sanderson will receive a minimum guarantee on each film that is produced, as well as a rich backend, allowing the author to make millions.